The Real Madrid forward has hinted at a summer transfer, and Neville would love to see him move to Old Trafford. Could Bale be on his way back to the Premier League? GARETH BALE COULD be a “game-changer” for Manchester United in the Lionel Messi and Cristiano Ronaldo mould, says Gary Neville. The Real Madrid forward has hinted at a summer move away from the Santiago Bernabeu, with the Wales international admitting after a match-winning performance off the bench in the Champions League final that he needs to be playing “week in, week out”. That has not always been the case in recent years, with injury struggles and fierce competition for places nudging the 28-year-old down the pecking order towards the end of Zinedine Zidane’s reign in the Spanish capital. 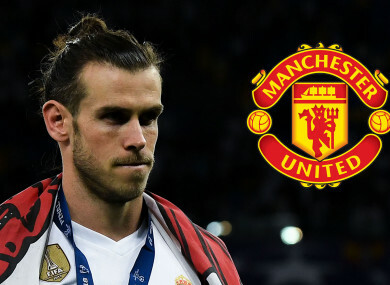 Bale has, however, shown on countless occasions – for Tottenham and Madrid – that he boasts match-winning qualities and Neville hopes they will soon be on display at Old Trafford. The former United defender told BBC Radio Manchester amid the mounting transfer talk: “I’ve got a lot of admiration for him as a player. “I’d like to see Messi play for United or Ronaldo or Neymar or all these players, but the reality is they’ve got to want to come to the club. “That’s the first question that needs to be asked. “If he wants to come to United then absolutely, yes, because he’s a fantastic player and he is a game changer. United are expected to be busy in the transfer market this summer, with Jose Mourinho under pressure to deliver following a trophyless campaign in 2017-18. Reports suggest that the Red Devils are closing on a deal for Porto defender Diogo Dalot, but there is the promise of more to come. If the right additions can be found, then Neville believes there is cause for optimism regarding potential domestic and European challenges next term. He added: “Once the disappointment finishes for all players and the coaching team and the fans, you always have that optimism for next season. “That’s the way football always is. You always feel optimistic as a United fan about the next season and what the team can achieve. “I’ve never – whether it be as a player, fan growing up, now today, never not felt optimistic going into a season. Email “Neville: Bale can be Man United game-changer like a Messi or Ronaldo”. Feedback on “Neville: Bale can be Man United game-changer like a Messi or Ronaldo”.